Detroit, Michigan, is known as the home of America’s auto industry but it is a city that has fallen on hard times. Today, Detroit suffers from high crime, a lack of good employment opportunities, failing neighborhoods and failing school. Detroit is a city of hurting people who need hope. 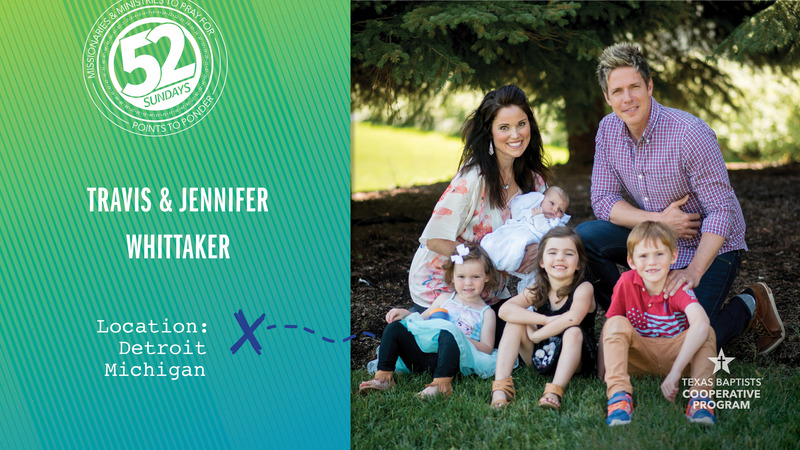 Our missionaries, Travis and Jennifer Whittaker, moved to Detroit in 2015 with their four children and planted Mile City Church. They wanted to offer the hope that only trust in Jesus Christ can produce. Travis and Jennifer want to see people transformed by the Gospel who will then be empowered to change Detroit for the better. Part of the support that enables the Whittakers to serve in Detroit comes from our church’s Cooperative Program giving. Let’s pray now for Travis and Jennifer and for each hurting person they reach with the Gospel in a city where hope is so desperately needed.